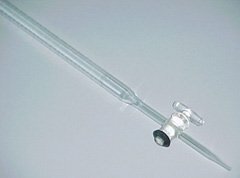 The high quality borosilicate glass burette with a PTFEstopcock is perfect of students because the stopcock is almost freeze-proof. 50ml Capacity. Sub. 0.1ml . 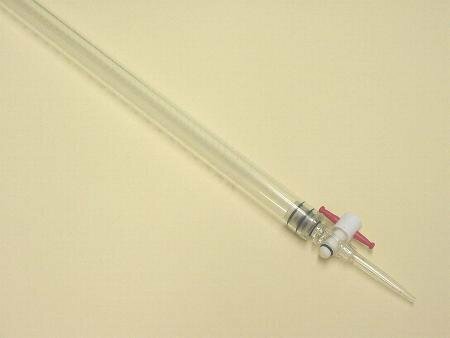 The straight bore stopcock burette has permanent and accurate graduation lines. Borosilicate glass with Ground Glass Stopcock. 10ml Capacity. Sub. 0.05ml. Class A. 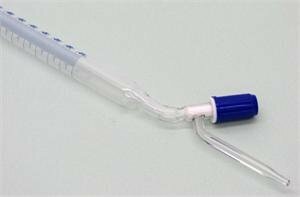 The straight bore stopcock burette has permanent and accurate graduation lines. Borosilicate glass with Ground Glass Stopcock. 25ml Capacity. Sub. 0.1ml. Class A. Also known as Geissler Burets. Capacity 25 ml. Accurately graduated, with white engraved markings, with fitted straight bore glass leak proof stopcock with capillary jet. Thick wall construction. Made from Flint / Neutral Glass. These high quality borosilicate burettes are straight bore with interchangeable PTFE key stopcocks. Accuracy is per ISO 385, DIN 12709. Accurately graduated with enameled graduations. Fitted with Rotaflo PTFE Plug, screwhead stopcock. Excellent flow control. 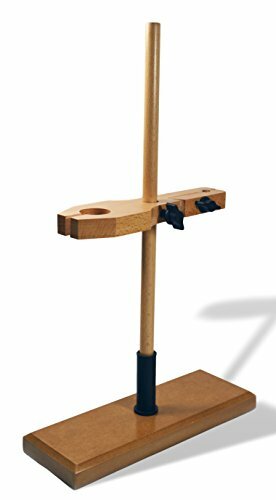 This polished wooden funnel and burette stand comes with clamping screws for adjusting the height. Up to 18" height. Base is approximately 11 1/3" by 4 1/4". Widely used for holding flasks, test tubes and so on in lab. 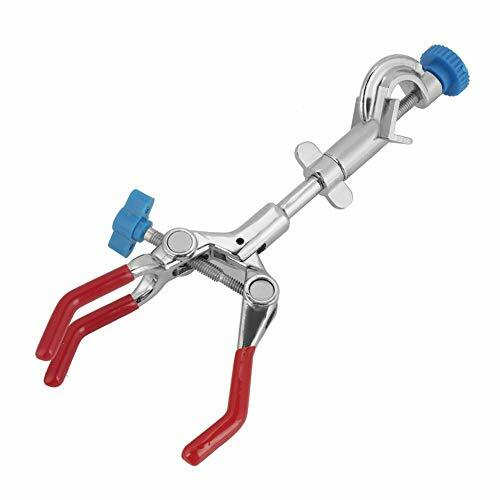 Made of durable metal material, the clamp has long service life. The adjustable clamp base can be easily fixed on a edge of desk. These borosilicate glass burettes have a reinforced opening and are permanently graduated with 1ml subdivisions. 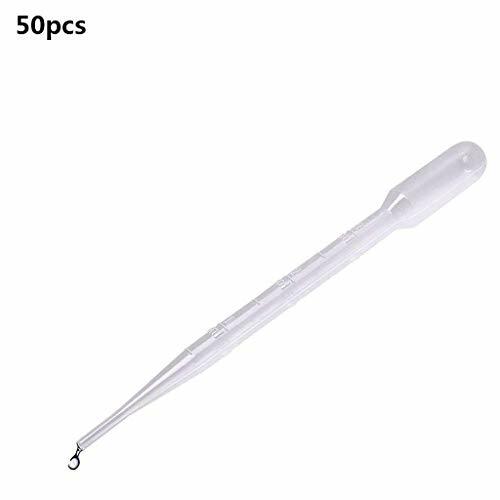 This burette has a 50ml capacity. Sold as a case of 10 burettes. These borosilicate glass burettes have a reinforced opening and are permanently graduated with 1ml subdivisions. 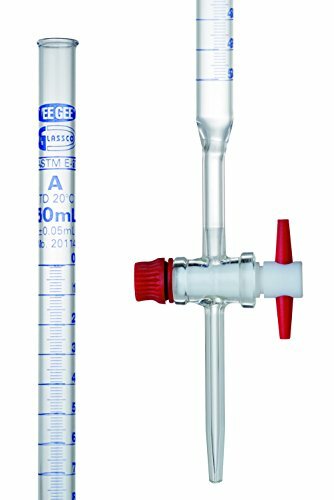 This burette has a 50ml capacity. Sold as a case of 10 burettes. Brand: GSC International | Manufacturer: GSC International Inc. This set attaches to our Mohr's style burettes. The set includes 2" of latex tubing, a pinch clamp, and a tip made from capillary glass. Sold in a pack of 12 sets. This set attaches to our Mohr's style burettes. The set includes 2 of latex tubing, a pinch clamp, and a tip made from capillary glass. Sold in a pack of 12 sets. 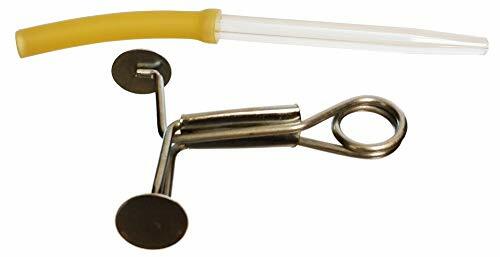 These acrylic burettes are made from a durable acrylic and have a PTFE stopcock. They have a capacity of 100ml. Sold in a pack of 10 burettes. These acrylic burettes are made from a durable acrylic and have a PTFE stopcock. They have a capacity of 100ml. Sold in a pack of 10 burettes. These borosilicate glass burettes have a reinforced opening and are permanently graduated with 1ml subdivisions. This burette has a 25ml capacity. Sold as a case of 10 burettes. This burette has a 25ml capacity.